I walked this, the first stage of the Capital Ring on 30th May 2005. For this section of walk I was accompanied by my son Thomas which made a pleasant change. We gradually made our way by bus, tube and train from Walthamstow to North Woolwich where we picked up the route of the walk. When we had left home it had been quite sunny but in the hour or so it took to get to North Woolwich it had clouded over and as we walked towards the Thames we were greeted by dark skies and a number of extremely load cracks of thunder almost directly overhead. 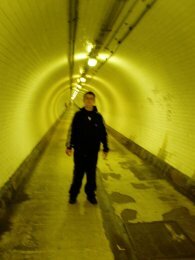 Photo 1 is taken at the Northern entrance to the Woolwich foot tunnel which takes the Capital Ring path under the Thames. As we were walking through the tunnel it started to rain and we were greeted by a very damp scene when we emerged from the Southern entrance of the Woolwich foot tunnel. Outside the tunnel entrance was a finger post, photo 2, giving details of the Capital ring, Thames path and also the Thames cycle way. It is always pleasing when the effort is made to signpost routes for walkers. This sign showed it was 6 and a quarter miles to our destination at Falconwood. It was raining quite heavily however after sheltering besides a building for a short while we decided to go ahead with the walk and set off in the rain, crossing the entrance to the Woolwich Ferry and making our way gradually to the Thames side path, diverting round an area of new building that was taking place besides the ferry entrance. The path follows the Thames for a short while until it is forced to divert through a modern housing estate up to the A206 just before the Thames Flood Barrier is reached. The Capital ring then follows the main road for a short distance, linking up with the route of the Green Chain Walk on the way before heading up to Maryon park. The walk along the Thames gave good views towards the Millenium Dome and the tall buidlings of Docklands, photo 3, the Thames Flood Barrier, photo4 and the boats and factories besides the Thames, photo 5. 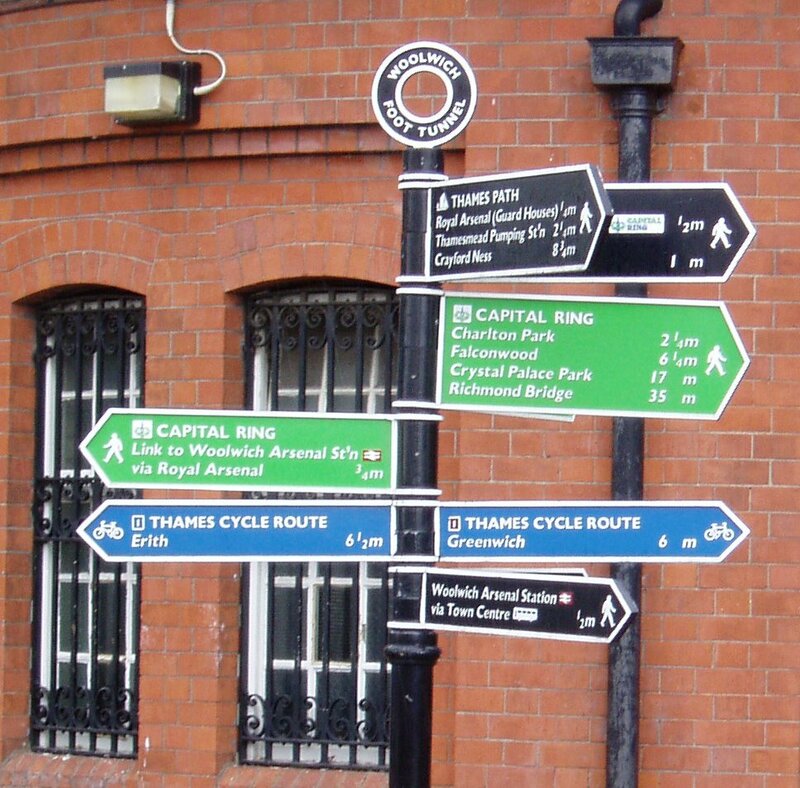 The route of the Capital Ring now follows that of the Green Chain walk all the way to Falconwood and indeed Crystal Palace at the end of stage 3. I had walked along the Green Chain walk as far as Shooters Hill a year or so previously but it was a pleasant enough walk to do again, with the views across London unfolding as you climb uphill away from Thames. As mentioned in the Capital Ring guide book Maryon Park is where some of one of my favourite films, Blow Up was filmed. The part of the park where one of the final scenes where the mime troupe start playing tennis after riding around in a jeep looks very much today as it did in the film. The path then passes through Maryon Wilson Park with it small zoo, photo 6, where we stopped andhad a short break under the shelter of a large oak tree, before continuing through Charlton Park and Hornfair Park to Woolwich Common, photo 7. At the top end of Woolwich Common the Capital Ring crosses Shooters Hill and heads into Eltham Common. 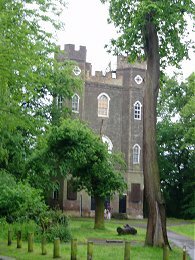 The path passes Severndroog Castle, photo 9, as it makes it way through a mixture of woodland and old gardens towards Oxleas Wood. Passing through Eltham Commom the views to the North across London are replaced by ones across the South London suburbs from what is the highest point of the entire Capital Ring. As we reached Oxleas Wood, photo 8, the weather brightened up considerably and we ended the walk in sunshine as we passed through Eltham Park North towards Falconwood station. Although it was only May I decided at the end of this walk that I would save the rest of the Capital Ring to do in the shorter winter months. I am still the process of walking the London Loop which it seems sensible to finish before starting anything else, as well as walking the Saxon Shore Way when I have more time on my hands. The GPS made this walk 5.86 miles long. Slightly less than as marked on the signpost at Woolwich but we did take a shortcut to the station at the end of the walk.